Busy parents can get this main course done in about half an hour. With a little seasoning and choosing baking instead of frying, parents can put a healthy twist on a classic kid’s favorite. 1. Cut thighs into bite-size pieces. 2. Place breakfast cereal, cornflakes, or crumbs into plastic bag and crush with a rolling pin. 3. Add all the seasoning ingredients to crushed mixture. Close bag tightly and shake until blended. 4. 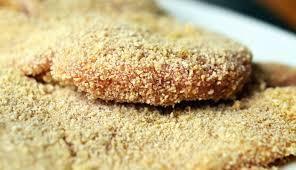 Add a few chicken pieces at a time to crumb mixture. Shake bag to coat all chicken pieces evenly. 1. Preheat oven to 400° F. Lightly grease a cooking sheet. 2. Place chicken pieces on cooking sheet so they are not touching. 3. Bake for about 12-14 minutes, until golden brown.